In the latest update to Waves, the frequency domain window brings back the log scale FFT relative power plot, which can be toggled to a Power Spectral Density (PSD) plot. Another mode allows you to overlay the PSD onto the Peterson NLNM and NHNM curves. Buttons in the frequency window allow you to reset the zoom (if you’ve zoomed in to a selection), filter to the selection (tick), filter out the selection (cross), and swap between linear, log and NxNM views. We’ve also added more poles, zeroes and normalising factor fields to more accurately scale the PSD plot, and these factors are saved to SUDS format files. 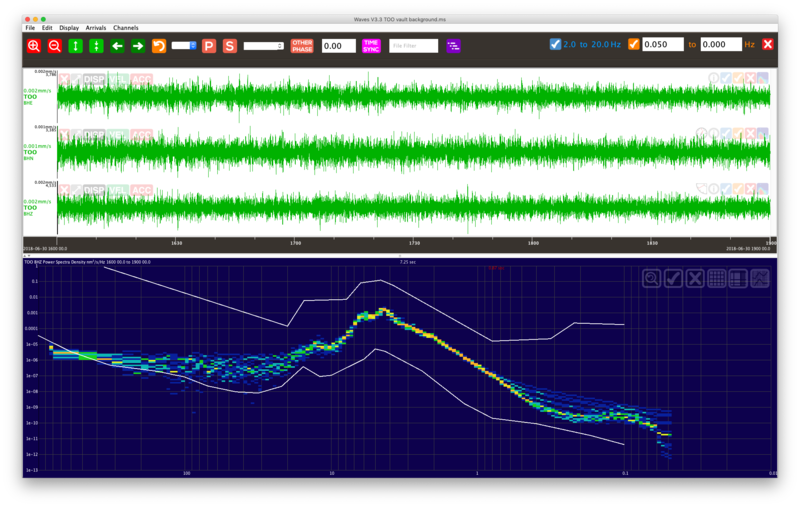 Version 3.0 of Waves introduced the ability to rotate your waveforms, both horizontally and in elevation. It also allows the customisation of the magnitude estimation formula. 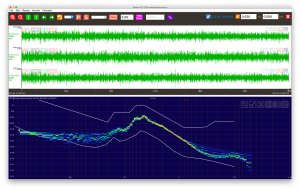 Other features include the ability to select and zoom in the FFT window to filter your data, either through selection or exclusion by notching out frequency bands. See the Waves user manual for all the details. Want to try out some sample data? Check out this magnitude 6.3 earthquake recorded on six Gecko accelerographs ranging from 40km to 110km from the hypocentre. You can even save it as a KML file and see a rough earthquake location using Google Earth. Simply click on the links below to download the version for your operating system. 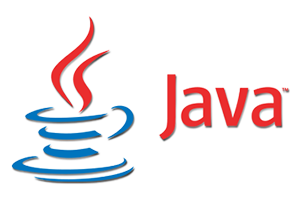 Waves is a Java application and requires that the Java Runtime Environment (JRE) is installed on your computer, which is available as a free download. The free version of Waves is supported by a 10-second advertisement which can be removed by purchasing a product key for A$110 per computer. Contact us if you would like to purchase product keys. A product key is available at no cost if you have purchased a Gecko seismograph or accelerograph. Limited to one single-use code per Gecko. We only send out a few emails a year, usually Waves software and Gecko Firmware update announcements, and occasional important news.